KARACHI: Pakistani exporters are eager to cash in on the Indian onion crisis in a big way as new Sindh crop finds its way into the market. Amid lingering tension after recent violation of line of control by India killing civilians, the exporters said that some four containers had already been shipped to India from the Balochistan crop prior to Eidul Azha. Total shipments from Balochistan crop stood at 35,000 tonnes including Indian shipment at a price of $300 per tonne (FOB). Onion prices have quadrupled hitting over 90-100 Indian rupees per kg in some Indian states while in Pakistan its wholesale price now hovers between Rs30-35 per kg while retailers are charging Rs40-50 per kg. 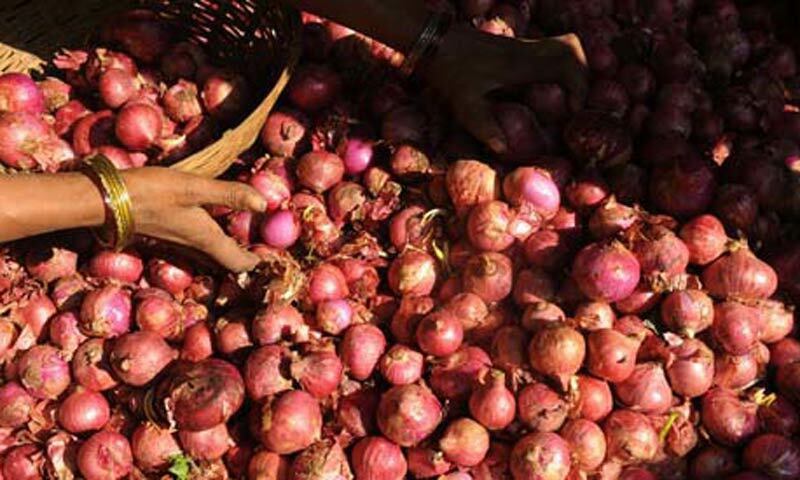 Onion price may drop in coming weeks when Sindh�s new crop, which started ahead of Eidul Azha, would arrive with full thrust from early next month. Waheed Ahmed, spokesperson of Pakistan Fruit and Vegetable Exporters, Importers and Merchant Association (PFVA), said that exporters are getting more enquiries from Indian importers. �However, the exporters are more interested in finalising the deal on full payment in fear of non-clearance of staple food or rejection by India owing to various reasons which they faced few months back in some consignments,� he added. He said that exporters look forward to ship 130,000-150,000 tonnes from new crop this season to various markets like Saudi Arabia, Dubai, Bangladesh, Malaysia, Mauritius etc despite tough competition with China and Iran. �In case we bag good orders from India then the exports will swell to over 200,000 tonnes this season,� Waheed said hoping to fetch a price up to $400 per tonne (FOB) from these possible export destinations including India. �We have a month�s time to take most of the share in Indian market mainly as India�s new crop may arrive in November,� he said. He said so far there are reports of good Sindh crop hovering 1.3 to 1.4 million tonnes and 950 tonnes of onion from new crop had already been sent to Bangladesh, Mauritius, Dubai, Malaysia etc. As per media reports, India has issued an import tender for onions. State-run National Agricultural Cooperative Marketing Federation of India (NAFED) said it was interested in buying onions from Pakistan, Iran, China and Egypt without specifying any quantity or mentioning any purchase price. The purchases would be completed by October 29. Private companies would also be allowed to import onion on behalf of NAFED. Indian onion prices had risen sharply despite government�s predictions that prices would drop following good monsoon rains. Indian media said that some imports of onion was already made from Pakistan, Egypt and China in the last three to four months after heavy rains washed out large portions of the crop in northern and western India. Union Agriculture Minister Sharad Pawar on October 24 had already warned the onion crisis may continue for another two to three weeks. India is making hectic effort to import onion from these countries without prior fumigation to cool down prices. Indian media reports said that earlier imports from China did not find acceptance amongst consumers because of poor pungency and taste. Waheed welcomed the Indian government�s decision of importing more onion including Pakistan and said that our local onion holds almost similar taste with Indian vegetable. Meanwhile, a vegetable exporter said Pakistan usually imports more vegetables from India owing to demand and supply gap or any crisis but India adopts lukewarm approach in taking vegetables from Pakistan in bulk or on priority basis despite a big relief of low freight charges both by sea and land route.